Here’s the Sonos Beam. There isn’t a ton going on from a design standpoint, which is probably for the best for a thing that’s meant to sit under your TV. You can really get a sense of how small the Beam is and what kind of audience Sonos seems to be targeting here. The Beam seems to be more of an entry-level soundbar for smaller rooms and TVs than a true Playbar or Playbase replacement. The top of the device contains simple touch controls a la the Sonos One, including a mute microphone toggle that prevents Alexa from hearing you. Sonos on Wednesday announced the Beam, a soundbar for living rooms with smart-speaker functionality similar to that of the company’s Sonos One speaker. The popular audio manufacturer announced the Beam at an event in San Francisco, California. The new device will ship on July 17 for $ 399, with pre-orders available on the Sonos website starting Wednesday. The Beam is a followup of sorts to the company’s existing Playbar and Playbase soundbars, but it costs less and comes in a smaller form factor. Sonos says it measures 25.6 inches long, compared to the Playbar’s 35.4 inches and the Playbase’s 28.3 inches. At first blush, the Beam has the sort of minimalist design Sonos typically gravitates toward. It has rounded edges, few external markings, and a fabric coating that runs around the length of the device. Touch controls on the top of the device adjust volume, change tracks, pause, and mute the internal microphones, much like the setup on the Sonos One. The device will be available in a black or white finish, and Sonos says it is wall-mountable. The Beam is also minimalist from a port standpoint: Sonos says it only has one HDMI-ARC port and an Ethernet jack alongside the requisite power port. HDMI-ARC is a feature of the HDMI spec that allows compatible TVs to send audio straight to a connected soundbar (or other home theater device) with one cable, regardless of the source of the audio itself. Using a remote to adjust a TV’s volume would just adjust the volume of the soundbar. ARC has been around for nearly a decade, and many TVs released in the past few years support it. (For reference, my $ 300 Roku TV that released last year has an ARC port among its three HDMI ports.) For TVs that don’t, though, Sonos says the Beam will come with an adapter that connects the device to a TV’s optical audio port and converts that audio to HDMI. Like the Sonos One, the Beam comes with Amazon’s Alexa digital assistant baked in. It seems capable of doing all the usual smart-speaker things—starting up music streams, answering general-knowledge questions, setting timers, and what have you. Sonos says the Beam has five far-field microphones to let Alexa hear your requests; by comparison, the Sonos One has six, while Amazon’s Echo Dot has seven. There are moments with the Sonos One when using Alexa isn’t as convenient as simply using the Sonos app, but generally speaking, the assistant behaves as it does anywhere else. The new thing: Alexa on the Beam has a small amount of TV control. Sonos says you can tell Alexa to turn a TV off and on and adjust volume through the device. This is done with the Beam’s support of HDMI-CEC. Sonos says the device can also control “Alexa-enabled video-streaming devices” like Amazon’s Fire TV, using voice commands to jump to certain apps and shows the way you could with a standard Echo speaker. Sonos has been promising support for the Google Assistant alongside Alexa, but the company didn’t give any more specifics on Wednesday about when that might arrive. Instead, Sonos is merely saying that it is “deep into working” with the software. The company has said that Google Assistant support will arrive some time in 2018. Enlarge / Alongside the Beam announcement, Sonos said on Wednesday that AirPlay 2 will arrive on a handful of Sonos speakers in July. This will technically get Siri onto Sonos speakers but not to the extent of Alexa and, potentially, Google Assistant. What will be available with the Beam is AirPlay 2 support, which will give Apple users the ability to send audio from an iPhone to the Beam (or a Sonos One, Playbase, or Play:5). It’ll technically allow them to connect Siri to a Sonos device and use Apple’s assistant to start tracks through Apple Music, too, though it won’t be as tightly integrated as Alexa. Sonos said on Wednesday that the AirPlay 2 update will come some time in July. You’ll need to own one of the four compatible speakers to get AirPlay 2 support, but having any one of them will effectively enable it on any other speaker in a Sonos setup. Beyond that, the Beam appears to work much like any other Sonos speaker. 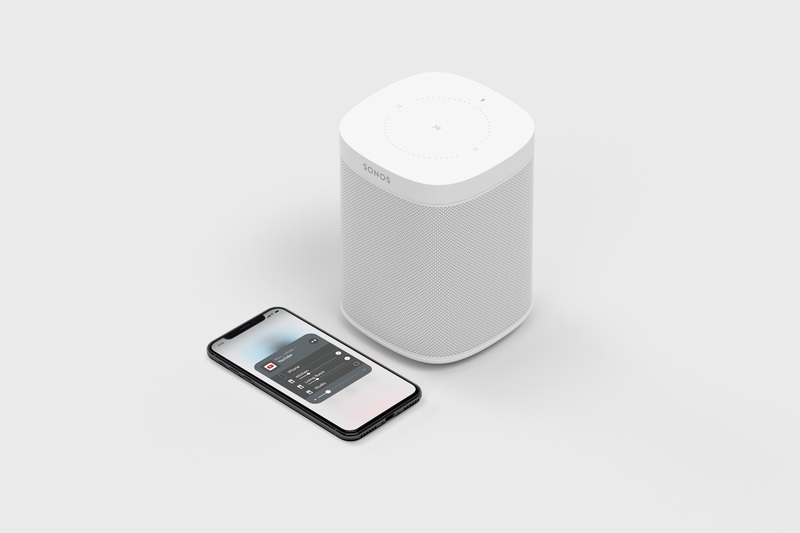 You can connect it to the Sonos app, send and control audio from a number of streaming services straight to it, and pair it with other Sonos speakers to build a whole-home audio setup. If past Sonos devices are any indication, it should be straightforward to set up. The device also seems to be focused on audio quality more than smart features. Given its smaller size, I’d expect it to lack the power and spatial separation of the Playbar, though it’s difficult to say exactly how things stack up without full testing. Sonos says the Beam has four woofers, one tweeter, three passive radiators, and five class-D digital amplifiers built in. It’s a three-channel speaker. You could add other Sonos speakers like the Sonos One and Sonos Sub to create a 5.1-channel setup, though that can get very expensive in a hurry. Also of note is that, while Sonos says the Beam supports PCM stereo and Dolby Digital formats, there’s still nothing in the way of Dolby Atmos or DTS surround-sound support. Future updates to the HDMI-ARC spec could open the path to the Beam supporting these kinds of advanced codecs down the road, but that would be dependent on Sonos and your TV making the upgrade. All of this likely won’t matter to a good chunk of Sonos’ intended audience here, but it may still frustrate home theater enthusiasts who were hoping for an upgrade to the beefier Playbar or Playbase, which also lack that kind of support. Instead, it seems best to look at the Beam as more of an entry-level soundbar—relative to Sonos, at least—for people who are interested in the smart-speaker craze and want something for a smaller room. The $ 399 price point does put the Beam on the same wavelength as Apple’s HomePod and Google’s Home Max speaker, and the device will likely have some appeal for those who already own Sonos speakers but not a Sonos soundbar. Still, we’ll have to use the device further to see if it’s a good value. Comcast outage takes out phone and internet service across the U.S.